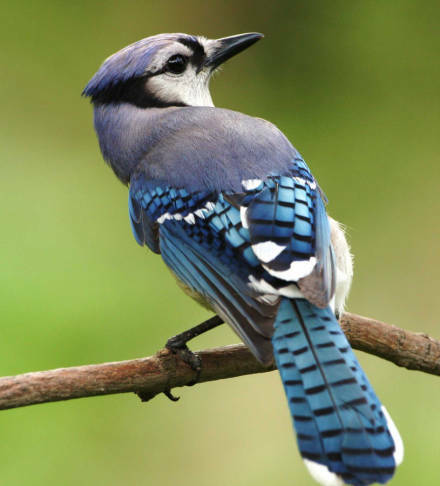 Hiestand highlights how the common Blue Jay is not the sort of bird that inspires us. It’s nest is rather humble, lacking organization and without any of the intricacies that we see in other nest builders. In fact, Hiestand describes the Blue Jay’s nest as a “motley jumble.” This is a bird that is not selective about what material it chooses for nest building, but will use just about anything on hand. Yet, this trait of adaptability – the fact that the jay CAN use discarded candy wrappers and plastic forks to build its nest (and doesn’t need a specific type of grass, for example) gives it an advantage. Like other generalist species, jays are very adept at adjusting to urban environments and human disturbance. As we seek to connect city dwellers to nature (and in fact, many of us are city dwellers), how do you think we should balance our approach of helping others appreciate generalists and specialists alike? From an ecological perspective, do you find it challenging to be enthusiastic about generalists like the blue jay? What are some strategies you've used to leverage a familiar generalist as a teaching tool and a springboard into a broader conversation about conserving wildlife? You do NOT have to be a "member" of anything to join this discussion. Start by posting a comment below! Centered around urban nature, the focus of these essays differ from more traditional wilderness experiences. Urban conservation is increasingly becoming a part of the vocabulary for the U.S. Fish and Wildlife Service. This series of essays is a part of the build-up for a training for staff, Friends, and Partners regarding the Urban Wildlife Refuge Initiative. We invite not only those who will be attending to participate, but also members of the public who are interested in the intersects between urban and nature. Blue jays are often disliked because they are seen as aggressive and predatory. As a true generalist they fill many roles in the environment: predator on insects and sometimes the eggs or young of other songbirds; gatherer (and planter) of acorns and other seeds; visitor and dominant force at bird feeders and picnic spots; and tormentor of house cats. Jays as a group are among the most intelligent birds, often displaying complex behaviors such as picking the ticks off of cooperative deer and livestock and storing collected caterpillars and dog food. Personally, I think using generalist species for public engagement is an excellent strategy. Consider the National Wildlife Federation, our nation's largest wildlife advocacy non-profit: the organization has had tremendous success around it's mascot, Ranger Rick the raccoon. Also, who remembers Cricket, the award-winning magazine for children? Ecologically, jays, racoons, and crickets certainly aren't the most significant species, but they can be a very effective "gateway" species for connecting people to nature. I think we do sometimes need to make an effort to see the “special” in the “ordinary.” I am often perturbed by the noisy messiness of blue jays at my feeder – and even more perturbed by the squirrels at my squirrel-proof feeders! I learned something new with Jim’s comments about the intelligence of the jays that will make me look at them a bit differently now. I also realize that much as I wish the squirrels would just eat a little less, I admire their inventiveness and their willingness to hang upside down to eat! I think, especially with children, these interesting observations about ordinary species can open their eyes to the wonders of nature in their midst. It seems to me that most urbanites have seen or know about many urban generalist but tend often to disdain them. Stories of damage and behavior that doesn't fit their ideal of wildlife have colored their views. But stories that show these wildlife generalists in a better light and pictures of their young or the adults in their struggles to survive increase admiration. But a balance must be reached because the more rare species or most at risk are often the specialist. So we must understand what it takes to help these creatures. I like the stories at the endangered species website. The partnerships formed and the actions taken clearly stated so we can see how sometimes just a clean up and a few changes in access or surroundings are simply implemented with cooperation and knowledge. I appreciated Emily Hiestand's use of humor in this piece, especially regarding blue jays' occasional consumption of other birds' eggs: "They should stop that, and also they should start eating more bright-orange and leafy green vegetables, more soy, and less fat." It's intriguing that the most-maligned animals tend to be generalists/omnivores (as are humans) and ironic that we dislike them for behaviors we also exhibit, such as theft and bullying. With that in mind, I'm writing articles that introduce children to some of these species--including blue jays. It's one way to go beyond the received wisdom, showing that every animal has a complex life history rather than a few traits to be reviled or glorified. Thanks, all, for your thoughtful comments. I especially like the insight that Christine shared: many of the behaviors that generalists demonstrate are also behaviors that we humans exhibit. This is something that I, as a science-trained conservationist, hadn't considered before and I find it fascinating. Looking forward to your insights for the next piece: A Paradise of Frogs by John Hanson Mitchell! First I want to say I really enjoyed Emily's article, and hope my book gets here soon. "As we seek to connect city dwellers to nature (and in fact, many of us are city dwellers), how do you think we should balance our approach of helping others appreciate generalists and specialists alike? " As a city dweller I find this question rather naive. Generalists like raccoons, possums and squirrels are too often feed by unknowing individuals increasing their numbers to hazardous levels. Deer in recent years have also become city dwellers. This I just feel sad about. And rats....well..I appreciate their tunneling/burrowing communities, but will exterminate where I find them in my environment. Where do we differenciate between invasive species (grey squirrels and possums are not native) and natives when living in the city? "From an ecological perspective, do you find it challenging to be enthusiastic about generalists like the blue jay?" No, I really enjoy all birds. The jays (my locality has scrub and steller's) seem to be appreciated by most people. Crows and seagulls not so much so, probably because their numbers appear so high. Crow families are quite interesting. We had a pair that nested in one of th big old fir trees near the house for about 20 years. I actually miss their family gettogethers every fall. The extended families are still about, but not nesting in the same location. The difficulties in the urban environment is that the most successful generalists tend to prey heavily on the species that are more specialists. Example was a raccoon family living in the neighbors yard for several years. The bird life became more scarce, including nesting crows, as well as possums, and squirrels. When the raccoon that claimed this territory was killed within 2 months we were spotting young possums and a much more varied bird life with at least ten more bird species commonly seen. Of course a young pair of raccoon have moved in late this summer so it will be interesting to see how fall progresses for the wildlife. A an urban habitat gardener the urban wildlife that most captivates is the insect life. Bees, dragonflies,spiders,cicada,butterflies, moths,crickets,beetles, the list is endless. Taking pictures,trying to identify and learning more about life cycles has become a real hobby that rivals bird watching. So maybe more exposure to the world of urban insects is in order. There are way more than most would imagine if you have a garden or good parks.